We extend an extravagant welcome to all, and you are invited to come as you are! There is no dress code for worship. You may see some people dressed in their Sunday best and others in jeans and very casual everyday clothes. We are not concerned with the clothing you wear; we are simply glad that you are here! Sunday School starts at 9am for one hour, so that ALL ages can gather together in worship at 10am. We teach our children by our own example. It is what our children see over and over again that becomes second nature to them. This process of learning begins at an early age. Even before they are able to accomplish a particular action our children are already taking notes. It is our act of including them in all of worship that reinforces the fact that they, too, are beloved children of God. We do have a “children’s chapel” outside the sanctuary, in case your little one needs a “walkabout” during services, but we welcome all the little ones to join us throughout our worship services, even the “noisy” ones! In worship, we follow a worship bulletin, but we are rather informal and flexible. Each worship service includes announcements, hymns and songs, prayers, scripture readings, a sermon (about fifteen minutes long), a collection of an offering, and a commission and benediction to send you off into your week with something to think about. It is our goal to connect scripture with everyday life that we may learn to live out our faith in all that we say and do. We look to the Bible for guidance and support. We believe that the Bible was divinely inspired, but written by human hands and hearts. The Bible was not written to inform us but to transform us. When reading and reflecting on scripture, we take time to prayerfully listen for the voice of our Still Speaking God. In Oldtown, we celebrate two sacraments, the sacrament of Communion and the sacrament of Baptism. Both are celebrated during worship and are God’s impartial gifts to us. We need not be worthy to receive them; we must simply be open to receive them. We celebrate Holy Communion on the first Sunday of each month. We believe that the Table is a place of extravagant welcome and is open to all who seek to know Jesus Christ. We celebrate Communion with gluten-free bread and grape juice so that none should feel excluded by dietary restrictions. During the service of Communion, we first serve those who have difficulty coming forward in their pews. Then, we invite the congregation forward to receive Communion by dipping a piece of bread into the juice, also known as intinction. Through the breaking of the bread and the sharing of the cup, we remember the story of Jesus giving his life for us. When we celebrate the sacrament of Communion, we believe that we gather with all the saints, those who have gone before and those who will someday be. It is a memory of what has passed, but an even more wonderful foretaste of what is to come. We remember, receive, and recognize Christ in our midst. 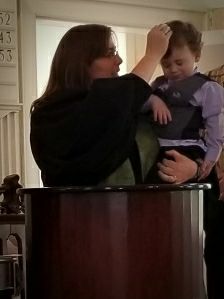 We baptize children of all ages from 1 to 101! Through the sacrament of Baptism, we are named and claimed by God. We are marked as children of God and welcomed into the universal church. We believe that Baptism is not an insurance of salvation but an assurance of God’s unconditional love for us. At Oldtown, in addition to our weekly worship service, we celebrate several “special” services throughout the year on different occasions. As always, all are welcome to join us for every service. On the first Thursday of each month at 6pm, we hold a service of Comfort and Hope. Sometimes the world seems overwhelming and we long for a safe place to rest. We need space and time to acknowledge our sadness and concern, and to know that we are not alone. We search for a place where we can listen, pray, light candles, reflect, sit in silence, and know that we are held in the loving hands of God. Ash Wednesday is a day of repentance and marks the beginning of Lent. It occurs forty-six days (forty days not counting Sundays) before Easter, and it derives its name from the practice of marking the foreheads of worshipers with black ashes in the shape of a cross as a sign of repentance. 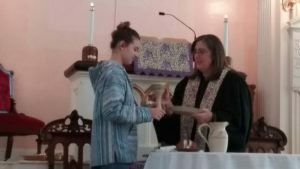 At Oldtown, our Ash Wednesday service includes a Litany of Repentance, the service of Communion, and those who wish may come forward for the imposition of ashes on the forehead or on the back of the hand. Tenebrae is a service celebrated on the evening of Maundy Thursday, the Thursday before Easter Sunday. This distinctive and moving service helps us to experience the events of the Last Supper. After the service of Communion, we light candles and sing and pray by candlelight. As the last song fades, the darkness recalls the days when Jesus was taken away to be crucified. On Easter Sunday, there is a great celebration at Oldtown as we share the good news that the tomb is empty and He is risen indeed!! The sanctuary is decorated with Easter Lilies and other beautiful spring flowers. Our word of the day is, “Alleluia!” and each time we hear it, we wave our bright strips of colored fabric high in the air to add to the celebration. After the worship service is concluded on Easter Sunday, everyone in attendance is invited to the front of the sanctuary where we take our annual family picture. Our Christmas Eve service is a joyous family tradition. We gather at 7:00 in the evening for a service of lessons and carols. The service is centered on the reading of the Nativity story from the gospel. Interspersed with the verses of the story of Christ’s birth are familiar Christmas carols that we all know and love, creatively chosen to accompany the events of the story. Hearing the story read aloud and singing the carols we all know and love is a wonderful holiday tradition we enjoy every year!